The fourth release on Bjarki and Johnny Chrome Silver’s bbbbbb Records, comes hot on the heels of the first. Two and three are limited run, vinyl only, hand stamped releases to be sought out from your local dealer. 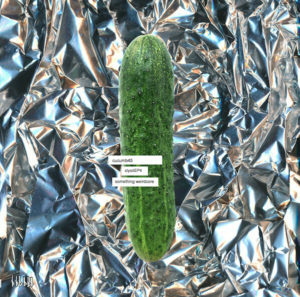 Bjarki returns as Cucumb45 with the 5-track EP ‘Something Weirdcore’. On the surface there are elements of jungle, breakbeat, techno and rave, but to say this spans genres would be an understatement – it defies them. The title track instantly commands attention with breaks samples offset against indecipherable robotic groans and melancholic chords, but a sudden change of drum pattern shows this is more than a reprieve of known territory – it’s a voyage away from the limits of tempo and genre. This theme is explored throughout the EP by way of unnerving stripped back techno (Akureyri), electro with subtle inflections of dancehall (Comatack) and even a big beat/dub influenced jam (Music for Advertising). As Cucumb45 plays with genres as we know them, so he does with the emotional resonance of the release. Frequently switching from euphoric to anxious, each track is a testament to his incredible attention to detail. Simply put, this is music for those who hate to be labelled.